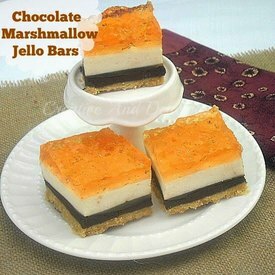 Four layers of delight in these Chocolate Marshmallow Jello Bars! They were so easy to make and to cut them into neat bars were extremely easy. It starts with a cookie crust with a layer of chocolate, followed by marshmallow and topped off with a jello layer. I was a little wary of the jello as I thought it might slide off from the marshmallow layer, but it did not - everything stayed nicely in place.